Mani Ratnam is back with a multi-starrer. 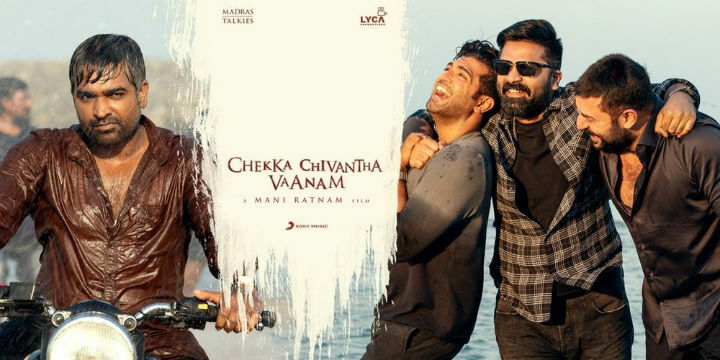 Chekka Chivantha Vaanam keeps the audience engaged with twists and turns. AR Rahman is at his best with an intense and terrific BGM. Though the film has a huge cast, all of them have done justice to their roles. Chekka Chivanatha Vaanam is a must watch. Veteran Director Mani Ratnam had a horrible outing last year with the movie ‘Kaatru Veliyidai‘. the movie was lashed out by critics and now after a year he is back with Chekka Chivantha Vaanam with a promising cast. Senapathi (Prakash Raj) is the crime Kingpin of Chennai and he is survived by his wife and three sons. The eldest is Varadan (Aravind Swami) and he lives a double life with his wife Chitra (Jyothika) and a secret love with Parvati. Second son Thyagu (Arun Vijay) and Third son (Simbhu) also have gangster aims. All 3 bros aim for the throne of Senapathi. Now, Rasool (Vijay Sethupathi) a cop enters and he is a former friend of Varadan. He is close to the family and soon Senapathi dies and this leads to war within the family. Rasool also plays his cards and create a huge rift between the brothers. The shivering climax reveals who is the real betrayer and who won Senapathi’s throne. Simbhu is back into the game after a long time and he scores in both romance and action episodes. He scores high than Aravind Swamy and Arun Vijay. Vijay Sethupathi as always gives a commandable act. Arun Vijay is smart and he is rocking in his role. But his screen space is limited when compared to others. Aditi, Jyothika are performing well in their given roles. The movie has a big cast and every one of them is adequate in their roles. A.R.Rahman’s BGM is terrific and intense. After a poor show in ‘Sarkaar’ Single, he proves that he is the real maestro. Editing could have been taut. The director also justifies the title. The movie has its considerable share of twists and turns and keeps the audience engaged every ten minutes.